We’ve all had days at work where we’re stressed. Where we can’t concentrate, and we worry, and our employees and colleagues irritate us and our workstation feels like the worst place to be. Mental health problems such as stress, anxiety, depression, and many more can have terrible effects on motivation, productivity, and general wellbeing. Mental health problems can also lead to increases in employee absence. 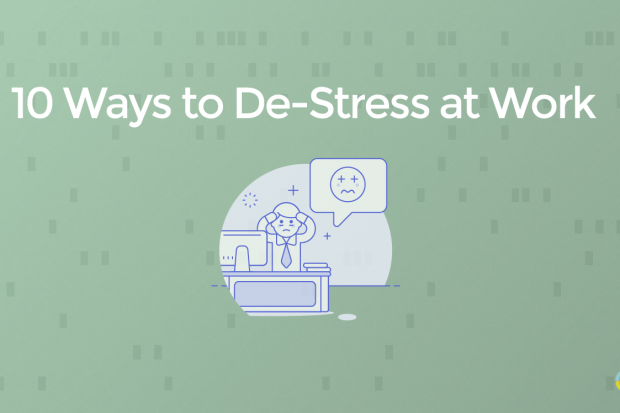 Fortunately, there are many little ways you can relieve some stress, and reset yourself to conquer your next task and feel a little better about yourself while you’re doing it. Taking some deep breaths while sitting in your chair is quick and free. Keep your back straight, and inhale through your nose. Exhale through your mouth and feel the air—and your negative feelings—leave your body. Do this for a couple of minutes. Keep each breath slow and steady. Try to focus on each inhalation and exhalation. You’ll feel calmer as the stress seeps out of you. Sometimes we all just want to wear our comfortable clothes and not worry about working in a pristine formal outfit. Introducing a relaxed dress code in your workplace can reduce stress by granting employees the opportunity to express their personalities through what they wear. Make sure you canvas opinion from all of your staff to review your current dress code, and accumulate ideas for designing a new one. You might want to consider jewellery and tattoos, too. Many employees will appreciate not needing to hide their ink. Always make sure your dress code does not discriminate against any persons or groups. And ensure that you keep all policies in your company handbook. Whenever you update a policy, email staff so that they know. You could hire a fitness trainer to come in and deliver a fitness class to your staff each week—yoga can be particularly re-energising. But you could also introduce short breaks into your workplace. The afternoon time following lunch but before employees go home can often be the point in the day when productivity drops. Employees start to feel tired, their bellies might be full, and they’re beginning to check the clock more than they did in the morning, often in anticipation of being able to leave. To combat this, a 10-minute walk outside in the fresh air could help people refocus their minds for the final hours of their day. If they take their walk with a colleague, a little non-work conversation can really help to distract people. It’s difficult to feel angry, sad, anxious, or even jealous during the exact moment you’re laughing. Laughter soothes tension, helps employees form relationships, and it increases the amount of endorphins that your brain releases. Laughter’s really good. Having a joke book in the office could be a trivial way of accessing some quick quips. Or, if you feel you need a chuckle to deflate your stress balloon, find the most amusing employee in the office and engage them in a quick chat. Perhaps your building has a bar, or there’s a local watering hole nearby. Once work finishes, there’s no harm in a beverage (doesn’t even have to be alcoholic) with your colleagues to wind down, talk about your progress and outside matters like sports, hobbies, and more. You’ll laugh and learn more about the people you work with while you’re at it. Some of us paint, write, play music, draw—some of us do one, all or none of these. If you’re a creative person, then keep a notepad nearby. A quick two minute doodle or scribbling down an idea for your next story can really help you to take your mind away from stressful work for just a few moments. After a couple of minutes, you’ll feel lighter and ready to tackle your next task. Some employers let their employees put their headphones on and listen to their music while they work. For many people, listening to their favourite tunes or even a podcast can help them drown out the distractions of workplace chatter and ringing telephones. Of course, certain employees simply won’t have the opportunity to put their headphones on and block out the world—so perhaps some speakers in the office quietly playing some ambient music instead? It’s tempting to spend your lunch period replying to text messages and checking the latest news—but you’re surrendering to more screen time. Get yourself a book. Fiction, a self-help book, a biography, whatever takes your fancy, and aim to read at least five pages while on your lunch break. You’ll be focusing so much on the escape of another person’s world that you won’t even remember being stressed. And who knows, you might enhance your vocabulary while you’re at it! An intense workload is going to cause stress, and clotting your body with unhealthy, sugary food might seem like great instant gratification. However, most jobs provoke a sedentary lifestyle, and a healthy diet will help you keep your weight down, your skin feeling clear, and even promote hair growth. Not to mention, preparing a healthy lunch can be an exciting activity the night before! Many people find themselves stepping into cooking for the first time when they’re making tomorrow’s lunch. It’s easy to jump from one task to another and make progress without actually completing anything. Create a to-do list every morning, or the night before if you think it’d work better for you, and list the tasks you need to get done during your next shift. Make a list of realistic tasks, and supplement it with bonus tasks that can wait until another day. If you finish the realistic tasks, move onto your bonus list. But remember to be aware that stress happens, often without you realising. Take breaks, breathe deeply, listen to your favourite songs, and pack a healthy lunch. Editors Note: This is a guest post from our friends over at BrightHR in the UK.